Students in RSTA's Creative Design class recently competed in Cambridge's "Martin Luther King Day of Service" poster contest sponsored by the Many Helping Hands 365. 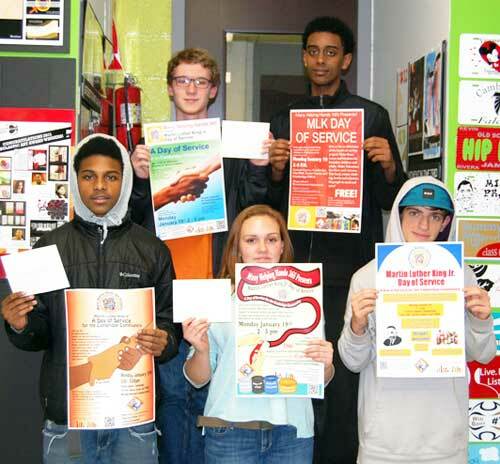 The poster contest guidelines included layout, design, for the annual day of service event for the Cambridge Community. The goal of the posters is to publicize the upcoming event in a visually appealing way that will attract those interested in participating in the hands on service project where volunteers make fleece scarves and blankets for homeless children and adults. Additionally, participants will make Valentines for elders and veterans and sort food, winter clothing, books and toiletries for people in need. The judging was based on originality and adherence to contest guidelines for each of the posters. The winning poster will be printed and displayed around Central Square, City Hall, Senior Center and YMCA and will be used for future marketing materials.